This smoke-free bed & breakfast features rock climbing nearby, scuba diving nearby, and mountain biking nearby. Stay in one of 8 guestrooms featuring flat-screen televisions. Complimentary wireless Internet access keeps you connected, and digital programming is available for your entertainment. Private bathrooms with showers feature rainfall showerheads and complimentary toiletries. 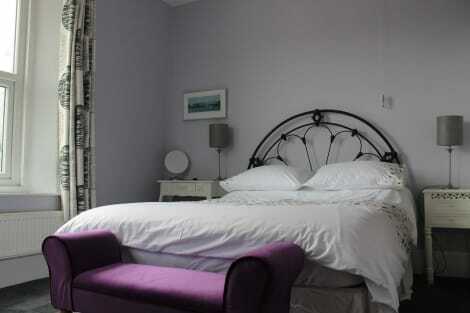 Conveniences include electric kettles and free tea bags/instant coffee, and housekeeping is provided daily. Make yourself at home in one of the 15 guestrooms featuring refrigerators and flat-screen televisions. Private bathrooms with showers feature designer toiletries and hair dryers. Conveniences include safes and desks. Located in Swanage, Amberlea Guest House is minutes from Swanage 18 Hole Pitch and Putt and Swanage Beach. This 4-star bed & breakfast is within close proximity of Swanage Museum and Heritage Centre and Durlston Country Park.Rooms Make yourself at home in one of the 7 guestrooms. Bathrooms have showers and hair dryers.Dining A complimentary full breakfast is served daily. At Grand Hotel Swanage, enjoy a satisfying meal at the restaurant. A complimentary English breakfast is served daily from 8 AM to 10 AM. If you're looking for sandy beaches, spectacular sea views and a buzzing little town with a charming village feel, Swanage is your ideal destination with everything you need for a great trip away. Set a short drive from Poole on the Isle of Purbeck peninsula in Dorset, Swanage is a rare gem of a destination with lots to do and see right on the doorstep and a lovely, relaxed atmosphere all year round. Originally a little port and fishing town, Swanage developed rapidly during Victorian times as both a centre for quarrying and a favourite holiday hotspot, and it's easy to see why. Close by are some of the most iconic and breathtaking sights in England, the chalk coastal hills of Ballard Down and Old Harry Rocks, and there are lovely wide sandy beaches to stretch out on. Swanage perfectly blends an unspoiled village feel with lively little eateries and venues, so you really can get the best of both worlds during your stay. Grand Victorian buildings in the town hint at its illustrious past as a popular 19th-century tourist resort, with the ornate Town Hall being just one example. And the Swanage Lighthouse is from the same era. There's always something going on in this bustling little place too, so it's worth checking out what's happening during your stay. Music events are hosted regularly, and the annual carnival is one of the best times to visit Swanage. To get a bit of a cultural fix, you can head off to the quaint L'Artishe Gallery and Studio, or go to the Swanage Museum & Heritage Centre to find out more about the town's local history. And to explore the countryside and soak up those stunning sea views, head off to Durlston Country Park. The town is packed with great little eateries and lovely hotels, so you'll feel right at home in no time. To give you a little inspiration, The Corner Restaurant is good for British food in a classy setting, Cauldron Bistro is a relaxed spot for a bite to eat, Chococo is a charming café, and if you're after a traditional pub, pop into The Globe Inn. When it comes to choosing a Swanage hotel, you'll be spoiled for choice. Lots have beautiful sea views, and there are plenty of options to suit your budget. Popular places worth checking out include The Pines Hotel, Purbeck House Hotel & Louisa Lodge and the Grand Hotel Swanage.